Japanese Maples are some of the most admired Bonsai in the World. They appeal to the general public because of their Spring and Autumn colour and to the enthusiast because of their ability to make beautiful specimen Bonsai. The question is which cultivars make the best Bonsai and which are best left alone? Garden centres have plenty for sale, but are they suitable? Let’s face it, they can be very expensive to buy as nursery stock. We will look at some of the types of Maples you will find in a Garden Centre and discuss their suitability for Bonsai. To look at each individual Cultivar would not be practical since the list runs into the hundreds but we will look at the most commonly found Maples available in Garden Centres and how they apply to bonsai. Your choice of Maple will depend on the final size of tree you wish to create. Nearly all Acer palmatum exhibit juvenile and adult characteristics. In trees planted in the open ground the adult characteristics of small leaves and close internodes seem to occur at 20 to 40 years, but this will vary by cultivar and environment. Under Bonsai conditions, plants may begin to attain these characteristics in as little as five years or less. You should plan your Bonsai based on mature leaf and internode size. The trick is to pick the suitable ones for your design. The larger leaf, more aggressive ones are suitable for larger two to four foot bonsai. For this size, a four inch or larger trunk would be best for most styles. This involves growing the tree in the ground or container to get the trunk size needed first. It will be necessary to prune and regrow the trunk several times to get the necessary trunk taper. This may take a long time to do but it is necessary to make a quality Bonsai with its leaf size in proportion to its overall size. From the finished trunk it will take another five years to get good ramified branches. Do not be put off by the length of time it takes, remember half the fun is in watching your tree progress and improve. 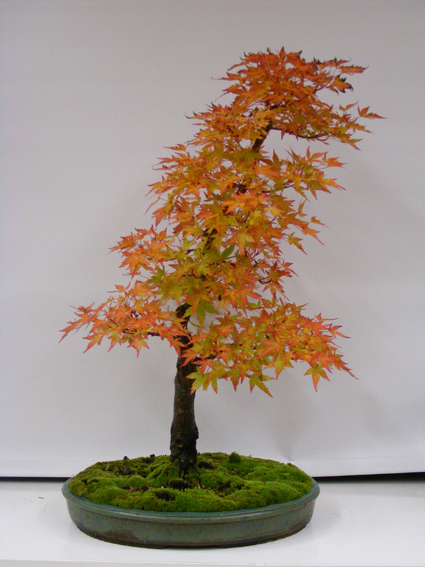 If it was easy and quick, everyone would have gardens full of specimen Maple Bonsai. There are many small leaf, short internode types that make good smaller bonsai, from Mame to Shohin and larger. These varieties of Maples are not readily available in Garden Centres but can be ordered from some of the Mail Order Specialists who advertise in The Bonsai and Gardening Magazines. These ‘Yatsubusa’ types have different characteristics, some are slow growers, others are quite aggressive even though they are small in stature. The dwarf cultivars really should be grown from cuttings for bonsai or grafted very low. Any grown from cuttings will give you a very nice thick radial root pattern that will swell into a broad crown and excellent taper. The uneven growth rate between the scion and the understock in dwarfs will give an ugly appearance in grafted plants after a few years. A very low grafted plant minimises this problem. The dissectums present the biggest challenge for adaptation to Bonsai. They are readily available in most Garden Centres and probably make up the majority of Maples for sale. Few of them can be grown from cuttings, and therefore must be grafted. Since they are mostly cascading or weeping habit trees, many plants are grafted high, or onto standards for landscape use. They also dislike wire and are better trained by pruning to shape. If you battle through all these problems you can end up with a beautiful Bonsai and probably one of a very small number of Dissectum Bonsai in Northern Ireland. Garden Centres will stock other varieties than those mentioned above but the large number of Cultivars available rules out any attempt to talk about them individually. Below is a small list of the Maples ( Acer palmatum) best suited for Bonsai but if you wish to see a more in depth listing of the many Cultivars and descriptions you should read Vertree’s book ‘Japanese Maples’. * These cultivars are commonly sold as Bonsai. From the list above you will see a number of cultivars commonly sold as Bonsai, the most popular being Deshojo, Segien and Kiyohime. The majority of mass produced Maple Bonsai brought into the U.K. are more than likely a trunk with a mass of branches in no particular shape. You buy them for their potential, carefully selecting one with a good trunk taper and root flair. Make sure it has plenty of branches evenly spread about the tree. Beware of bad graft marks. You may be lucky and find a larger specimen Bonsai but you will also find the usual high price attached, you pay for quality. The Acer palmatum is not the only Acer suitable for Bonsai. The Trident Maple, ‘Acer Buergerianum’, is very popular and many fine specimens can be found. Many cultivars of Acer japonicum can also be used for Bonsai but they seem to be under represented at present. 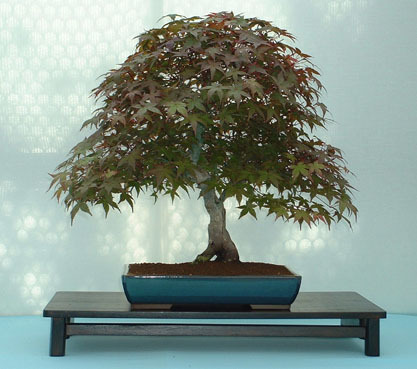 The easiest Maple to acquire at a reasonable price is the Field Maple, ‘Acer Campestre’, which is commonly used for hedging and makes a fine Bonsai. For the brave of heart the Sycamore is even a Maple but takes a long time to reduce the leaves. Although you can repot almost anytime this is the optimum period for the majority of Maples. Kashima and Kiyohime will have started to move at this time. Make sure they are protected. Feed 0.10.10. (Zero Nitrogen) every 7 days to stop lush growth but only after the buds have opened..
Start plucking out the bud centres. After the first two feeds start High Nitrogen feed to build stamina on young trees. If you want good Autumn colour cut down your High Nitrogen food. If tree is healthy then consider full or partial defoliation. This can be followed with selective wiring. Remember that the tree will have to be looked after the same as February to May or Spring. The problem in Summer defoliation is Sun Burn rather than winds. Wire trees with Cage (not tight) or protected wire and do any major pruning at this time during summer dormancy. Reduce feeding until mid August or late mid summer. Start a weekly feed with low Nitrogen food. Last time for defoliation before Autumn. Trim all leaves that grow out of the planned shape. Stop feeding if leaves start to change colour. It should be noted that good Autumn colour is achieved with little or no feed….but the question is whether or not you want to risk the tree’s health for a short term benefit. Complete your feeding with low or Zero Nitrogen Feed. Remove any dead leaves and make sure that the trees are protected against winter frosts and wind. This is the other time when you can perform major surgery on your Bonsai. I hope this handout helps shed a little more light on the subject of maples. If you are interested and wish to learn more about Maple Bonsai, I would suggest you subscribe to the American Magazine, ‘Bonsai Today’. This publication has many in-depth articles on the care and training of Japanese Maples and surpasses most of the books on the subject. One exception to this is the book by Peter Adams about training Maples and is a must for the enthusiast. As mentioned before in this handout the book ‘Japanese Maples’, by Verdees is a must for your reading list and covers most aspects of the species for your garden or for Bonsai.